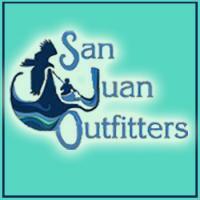 San Juan Outfitters reduces, reuses and recycles at every opportunity. We have recycle baskets on all boats, docks and offices. We keep our carbon footprint at a minimum by planning ahead. Our boat Sea Lion is so fuel efficient it uses only 10 gals per hour hauling 40 guests. 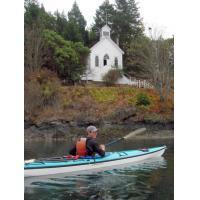 San Juan Outfitters has easy in and out custom kayak finger docks (no getting wet or dragging kayaks out to the water) at both Roche Harbor, on the northwest side of San Juan Island and Friday Harbor on the east side of San Juan Island. Our exclusive facilities at both harbors allow our guests safe and easy access to the water. You do not need experience to join our any of our tours. We supply all the equipment that you will need. 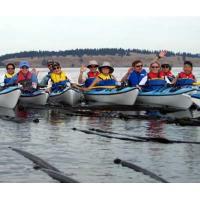 You will tour in a hand-made fiberglass, touring kayak that we keep in prime condition. Your guide will be knowledgeable, experienced and enhance your experience on the water. 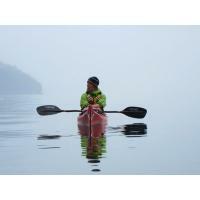 Our exclusive locations allow us access to areas where no other kayak company can go. They include a combination of protected water, wildlife refuges, and access to big open with expansive views of Haro Strait, The Olympic Mountains, Cascade Mountains, and beautiful shorelines. San Juan Outfitters belongs to a spotting network for whale sightings and our captains share whale information hourly with our kayak guides to increase your chances of sea kayaking with Killer Whales. 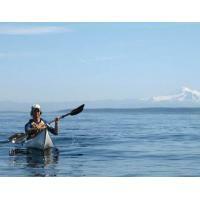 We design our trips to offer our guests an amazing sea kayaking and wildlife experience regardless of Killer Whales. Whale Watch and Wildlife Tours by Boat – a 90% success rate for viewing whales. Guests will appreciate our small guide to guest ratios. 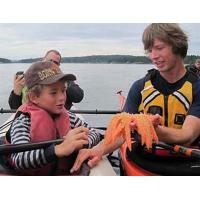 You will enjoy interacting with your marine naturalist in a classroom size tour boat. We have 3 whale watch boats; 32 foot, 42 foot and 55 foot long. These boats are also available for private charters and for water taxi. All of our kayak and whale watch tours depart daily from both Roche Harbor and Friday Harbor from April through early October. 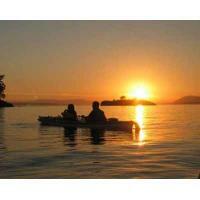 June to August we also offer Sunset Kayak Tours and Sunset Whale Watch by boat. Whether you are on our sea kayaking tour, whale watching by boat or both, our guests typically see Orca (Killer) Whales, Porpoise, Harbor Seals, Sea Lions, Bald Eagles, and a wide range of usual and unusual Marine Birds plus land mammals. Attention to detail in all that we do. 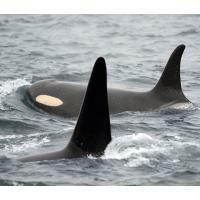 San Juan Safaris Whale Watch & Wildlife Tours has new owners. Bill Wright and Colleen Johansen are pleased to announce they have sold San Juan Safaris Whale Watch & Wildlife Tours to Brian and Rachel Goodremont. 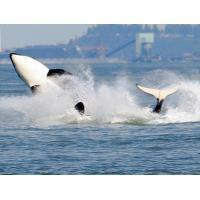 San Juan Safaris was established in 1995 with only 3 touring kayaks operating out of Roche Harbor. 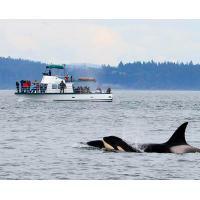 By 2007 San Juan Safaris had expanded to both Friday Harbor and Roche Harbor with 30 employees. Brian began working at San Juan Safaris in 1997. He ultimately become the Operations Manager and held that position until he purchased the Roche Harbor operation in 2008. 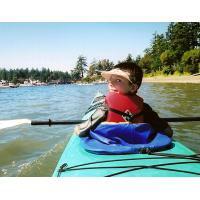 He took over all kayaking and 1 whale watch boat and formed San Juan Island Outfitters. 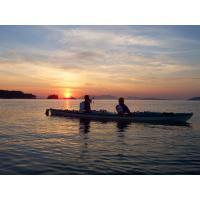 Over the last 5 years, San Juan Island Outfitters has grown and offers; kayaking tours � 3-hour, 5-hour and overnight camping. 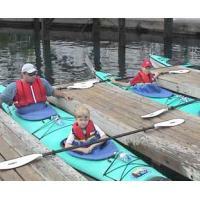 They also offer kayak rentals paddle board rentals & small boat rentals. San Juan Safaris office is located underneath Downriggers Restaurant . Tours are offered daily from April through October and other months by appointment. For more information, call 378-1323 or 800-450-6858.